We are happy to share with you a number of exciting updates with ChARM EHR. 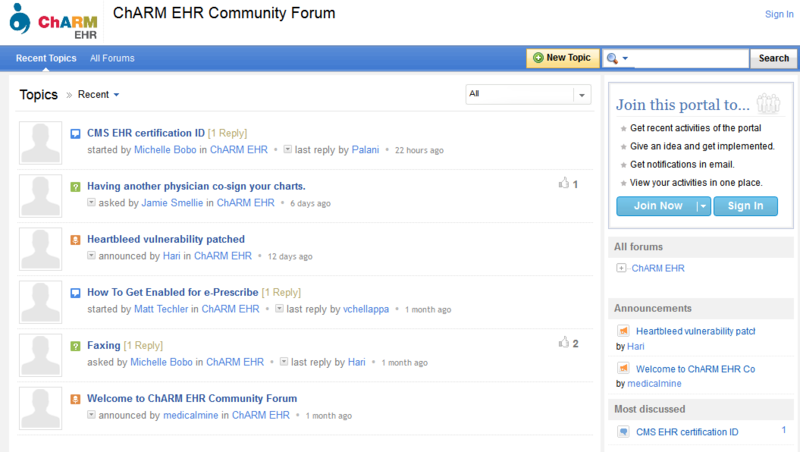 We recently launched our ChARM EHR forums to provide you a quick and easy platform to interact with and ask questions of other ChARM EHR users. Our ChARM EHR staff also frequents the forums so feel free to post questions and comments and we'll respond at the earliest! Click HERE to check out our new forums. Recently there has been some concern regarding the "Heartbleed vulnerability" - a new bug going around the internet that compromises security. Rest assured, ChARM EHR servers have been patched to protect your data from being exposed through the Heartbleed vulnerability. We have no indication that the vulnerability has been exploited against our services. As always, it is good practice to frequently renew your passwords and keep them secure.